So, I know it’s wrong. But. Hey… if you wanna be part of the it, you gotta sign up to be a demonstrator. That’s part of the perks. But, I couldn’t WAIT to show you what I get to play with!! Though I cannot show you the set of stamps, I can show you stuff I made with said stamps. So, in this, I’m using the Madison Avenue Stamp set, the coordinating Sycamore Street DSP, and Vine Street (TIEF). ALL of these items are in the SAB catalog (which means, you get one free with every $50 you spend on merchandise). YAY! Here is a close up. (Gasp, you do have to cut the tangerine tango layer out of the flower by hand….) Sorry. But, it adds SO much… it really doesn’t take long. I don’t know why, but I’ve been in a texture layering mood lately. So, as you can (kind-of) see, the rich razzleberry is embossed with the vine street (TIEF). Then, I layered the DSP with the same print, then dsp with polka-dots and a solid (Tangerine Tango). I just love the bright colors. It really is kind of an ‘in your face’ card but it is a perfect, cheery, “Hello” in an envelope. The card base is made out of summer starfruit (confession, when I first saw starfruit, I thought it looked vaguely similar to something that comes out of a newborn… BUT… IT IS PROBABLY ONE OF MY FAVORITE COLORS now…) absolutely love it. And, I would nave never thought of using these colors with it, but was just trying to keep the same as what is in the dsp… And, it works!! Those SU designers have it all figured out. You will get a chance to earn SAB products starting January 22. So… if you wanna host a workshop (get more stuff for free) give me a call and we can set a date. Also, if you haven’t received the new Occasions Mini, or the SAB catalog, let me know and I will be happy to get you one. Anyway, As preparations are being made for ringing in a new year, I wish you the best. And, hopefully you are safe and have a little time to enjoy some crafting!! And family!! and friends!! and… and…and… we are so richly blessed…. Translated: Isaac says MERRY CHRISTMAS! Well… Gotta love pinterest. Lots of ideas to copy. Perhaps my favorite place for inspiration. 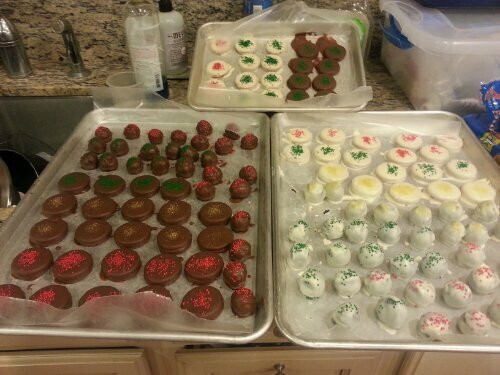 Anyway this post is all about Christmas treats. I love making them. And I love eating them. 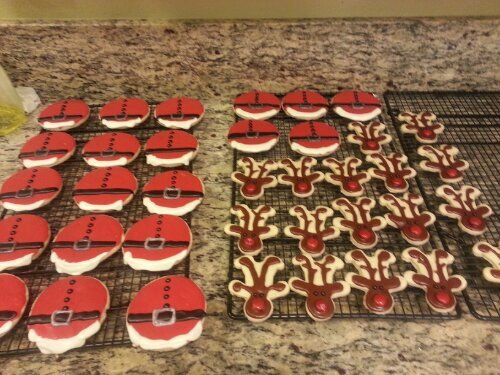 But I especially love making them with my mom and sisters. It wasn’t in the plan this year though. 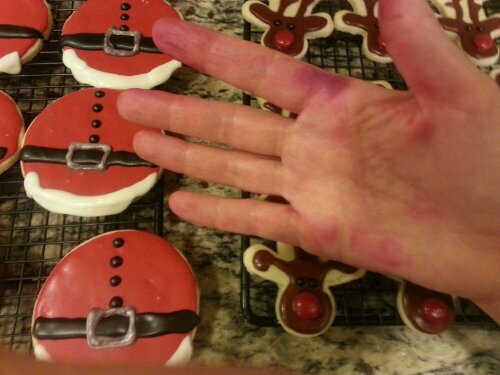 Last summer we made my favorite Christmas treat in July… Mom’s homemade chocolate covered cherries… The 4th of July may just become the 2nd Christmas… As far as treat making and eating goes. So… Here are the tags! And, I wanted to show you some mds tags I made. 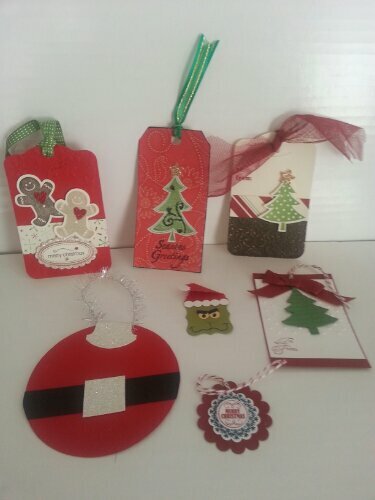 In an effort to simplify Christmas, I decided to make a bunch of tags. 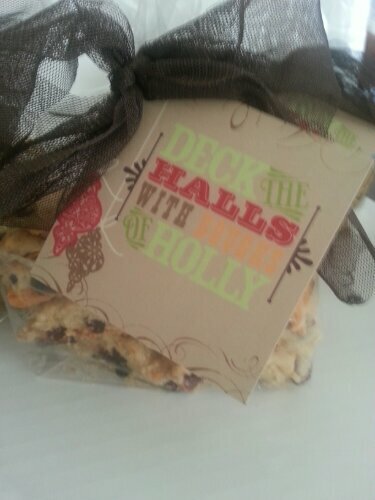 These can be used on gifts, neighbor gifts, whatever… Love it… Cause I made it but it was so fast and easy…. Take time to enjoy each other. So… I know I need to get a post up with all my tags I got from my swaps… Promise. I will. 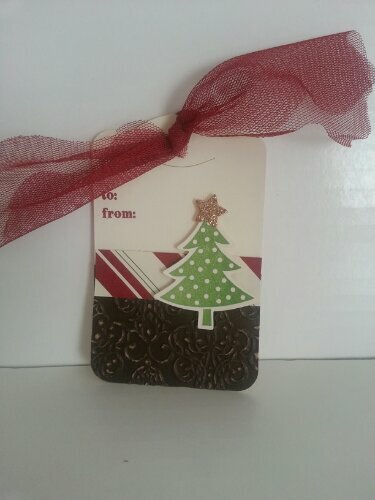 But I wanted to share with you a tag I made for my “Christmas Lemons”. This year I decided to make lemon curd for the neighbors. It has been a bountiful year as far as the lemon tree is concerned and I wanted to share some of the deliciousness it provides. 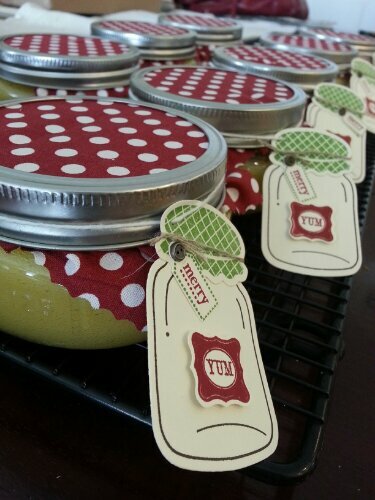 Of course, I needed a super cute tag for the jar… So the perfectly preserved framlits was perfect! And that yum stamp…. Is a SNEEK PEEK. Now… You can’t wait for January… Can you? Thanks for stopping by on our blog tour for this month… As you probably know, the chosen stamp set is Affection Collection (item 127949 for clear and #127946 for wood). It’s found in the Holiday Catalog. This set is one I probably wouldn’t have looked at in a catalog and chosen. We got it for convention, and then it was chosen for the blog tour. Which is nice, cause it is causing me to take a second look at thinks that I originally passed over. Thanks for stopping!! Enjoy your Tour!! First: Check out these super neat holiday ornaments. 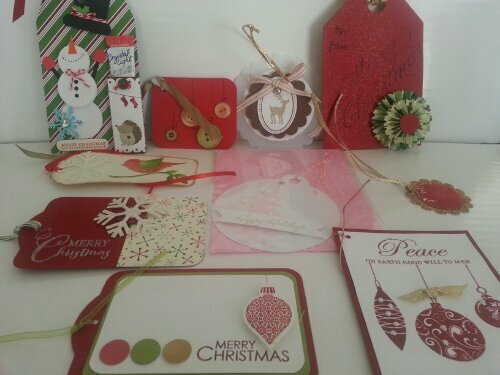 Stampin’ Up Holiday Packaging Bundles! 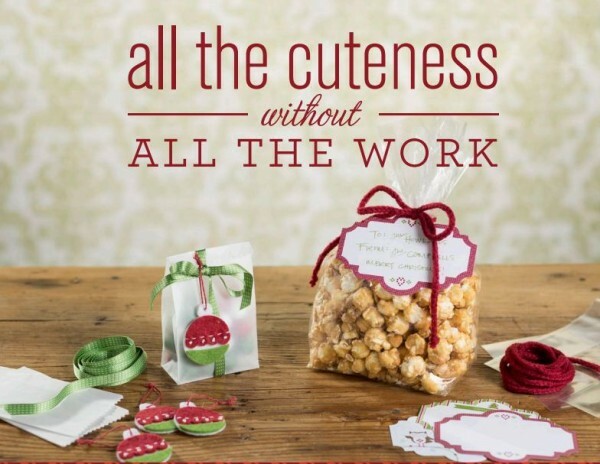 All the Cuteness without ALL the work!! Are you done with shopping? Are you already feelilng the “How will I ever get it done?” holiday pressure? 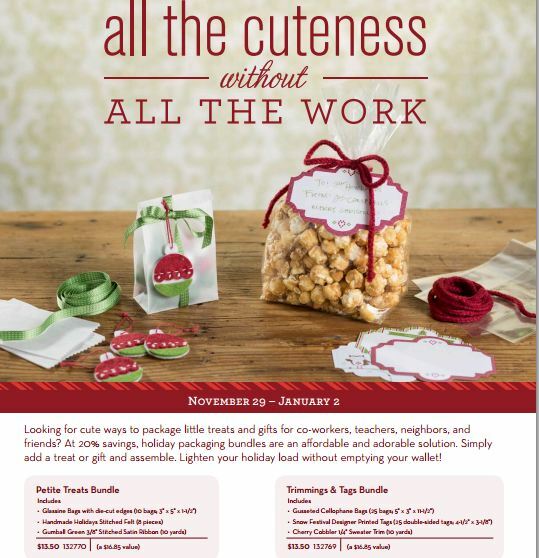 Let me help make your presents the cutest under the tree and take some of the holiday pressure off at the same time. For a LIMITED TIME ONLY Stampin’UP! 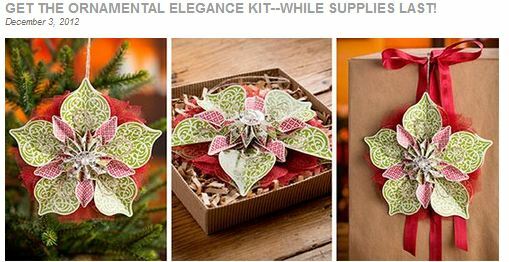 Has two Holiday Packaging Bundles available.. Order via the SHOP now button or add to any party order! Well… Let me know if you want to pick up a few of these… Or you can order from my online store.